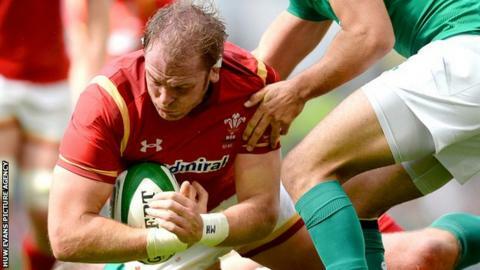 Wales second-row Alun Wyn Jones says he is fit and ready to face England at Twickenham on Saturday. The 30-year-old Ospreys lock has not played since injuring a knee in Wales' 16-10 win over Ireland on 29 August. But he is looking forward to facing the World Cup hosts, and believes Wales can call on their experience of success at Twickenham. "We've just got to realise that we've been here before," said Jones. "We're realistic about the opportunities and the success we've had there." Jones has twice been on the winning team at Twickenham, in 2008 and 2012 when Wales were on their way to winning a Six Nations Grand Slam. His place in Saturday's Pool A game had been open to question after his injury at the Aviva Stadium in Dublin, but Jones says the injury was never as serious as it was reported. "A lot has been said about it, but it looked a lot worse than it was," added Jones. "It wasn't ideal, but a lot of guys have got niggles going into the campaign and it was just one of those. I've trained since the week after it, so no problem." Jones believes England will be making a mistake if they set up their defence to nullify Wales centre Jamie Roberts. With injured centre Jonathan Joseph missing the game at Twickenham, rugby league convert Sam Burgess is set to start alongside Brad Barritt for the hosts. Burgess - who played loose forward in rugby league - is expected to meet the double British and Irish Lions tourist head-on. But Jones says Roberts' centre partner Scott Williams cannot be underestimated. "Everybody seems to not mention Scott so if they [Burgess and Barritt] were to be involved there'll be more than a bit of containment to do." But Jones expects the English midfield to be about more than just defence. "I think Burgess is one of the top off-loaders in that squad and obviously Barrett can attack as well, so I'm sure that's the selection those players will want to put on a bit of a show in attack as well as defence." With Australia also in the mix, Pool A has been described as the Pool of Death, but Jones is not fazed by the quality of the opposition. "I've been fortunate to be involved with the Ospreys in European rugby and I've found myself in the pool of death every year so I'm very comfortable being in a pool that's tagged that way," he added. "Hopefully there'll be a different outcome this time in a red jersey. "We appreciate how hard it's going to be but we can only go one game at a time."